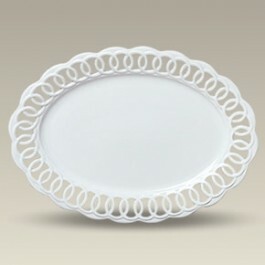 Use a ribbon to dress up this elegant white porcelain openwork serving platter. The 16" long oval dish functions as a great serving piece during your next dinner gathering. Made in China. Microwavable and dishwasher safe. This item is a SELECTED SECOND. It contains slight imperfections. All sales final.